Last week I caught a screening of The Upsetter, the new Lee “Scratch” Perry documentary, at the Downtown Independent theater. For Perry fans, hell, for anyone interested in the genesis of reggae and dub, the doc comes highly recommended. Later that night when I got home I went digging through the stacks for some Upsetters stuff to throw on, and by chance happened upon a totally unrelated LP—West African Cosmos, a record I had been meaning to highlight on AD for some time. If you dig on West African afrobeat and fusion this album is indispensable. 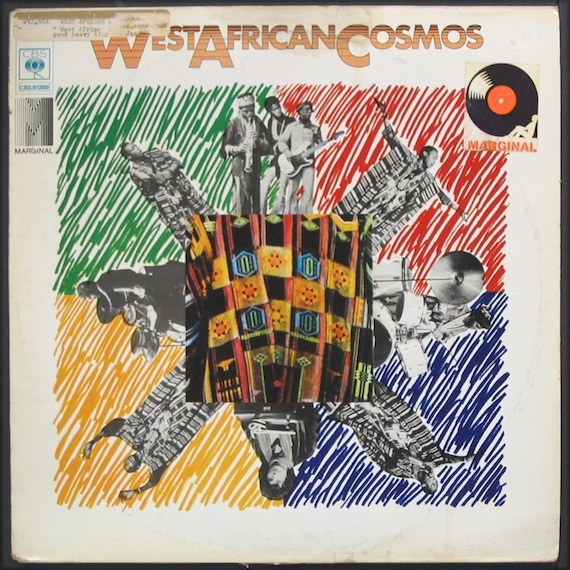 Alternately recorded in Paris and London between 1975 and 1976, and released by CBS Records, several of the West African Cosmos tracks have popped up on compilations over the years. All good, but for those of you feeling the two samples below, I seriously recommend seeking out the LP in its entirety. You’ll thank me later. Thanks Cory. I found an alternate choice. Very excited to listen to this in its entirety. bees knees as usual, Thanks Man! Wow! I haven’t had a song hit me up side the head (in a really good way!) like Wuye Wuye just did. That was everything music should be. This is a great LP….never released on CD….Best quality I have is 320Kps….wish someone would rip/upload in 24/96…or at least 16/44….or even better..CD or Vinyl release/re-release ! Nice, will be playing a track from them on my radio show next week.